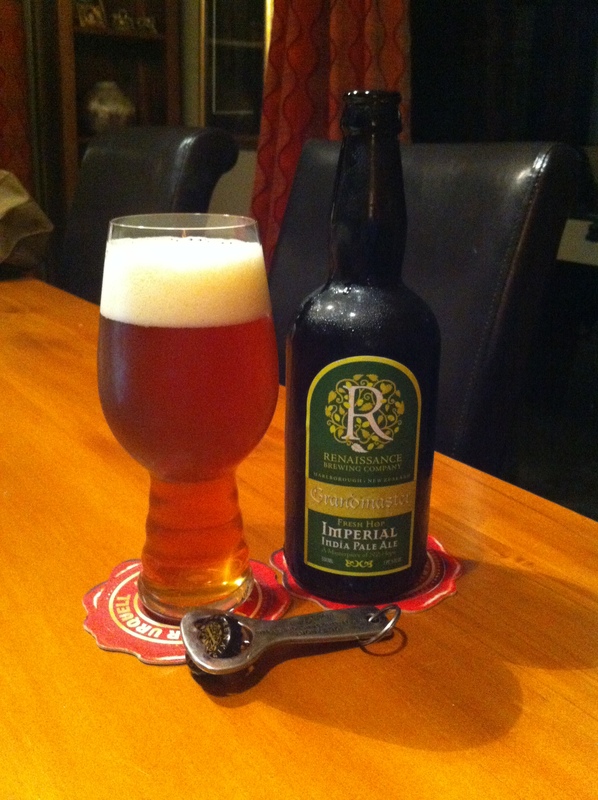 The annual fresh hop offering from Renaissance, This in the bottle, the Grandmaster Fresh Hop IIPA. I had it last year and loved it, I had it recently in the keg version, didn’t like it so much, and I’m giving the bottle offering a go, because, well, balance and all that. To brew this special Ale we have used large amounts of freshly harvested hops, and for that we have selected a New Zealand classic – one of the first hops developed and released in NZ – Southern Cross. Southern Cross is a hop that is a mix of British and American in its flavours…..but developed and grown in NZ. It has big citrus flavours and also some spiciness not dissimilar to British Fuggles. This works incredibly well with the malt back bone – delivering a brilliantly balanced fresh hop Double IPA. So then, what could possibly go wrong with that? There seems to be a lot more malt sugar aroma in this than the keg version, and less grass hops. Dark orange and cloudy looking pour with whats starts out as a lovely full head then settles to a smaller scant covering in the glass. Lot more hop grass aroma in the glass and an underlying fruitless like perhaps orange. Wow, that is brilliant at first sup, rich malt mouthfeel with a nice amount of bitterness that has a long taste and a great finish that isn’t anything other than a “just have more it’s that good” taste about it. The subsequent mouthful though begins to show why I think the balance of this isn’t quite square and the brash hop green-ness begins to assert itself on the palate. It is lovely and sweet still though, and this lulls you into thinking you can take large quaffs with impunity, but as I found out that hop finish is quite abrupt and a bit of a stopper. It has the potential to be a bit of hard work to finish. Which would be a pity. It does however, to me, confirm that I think this isn’t as good as the last year version which made me want to dance a little, and is instead a rather hop driven beer that is trying to be balanced by a malt middle. Doesn’t quite work. But then, in a flash, if not a grand flash, it was gone. Just like that. The problem for me with the sweeter malt beers is that I’m a bit of a sucker for that, and it plays to my own preference in taste. Still think this is better than the keg version though but a notch or two, and I’m sad I don’t have another bottle because it is substance over bulk. The pdubyah-o-meter rates this as 9 a of its things from the thing. I like this as a beer, it isn’t fireworks and ‘be still my beating heart’ good, but it has a lot of the things that are must have and go-to in a taste. I like that it is hoppy and I enjoy that it isn’t dry at the finish, I like that it is sweet but that it has bitterness to balance against it. I don’t like that the hops are a mite aggressive and shouty, just a bit, and that would be the only thing. I finished it, I turned to sad love songs to console myself. Where did I get it? Liquorland Forrest Hill, my go-to place for the good stuff. Am I enjoying it? It is a corker of a good beer, not perfect but it is worthy. Would I have another? If only I’d thought this through I’d be able to dial up another, which I’d easily go, and perhaps a 3rd for a short night in. Would I share with a friend on a porch and set the world to rights? I think you could because I think the hope profile is a bit polarising in this, and I also think that it is a pretty accessible beer of some merit and might, in the bottle, win awards. 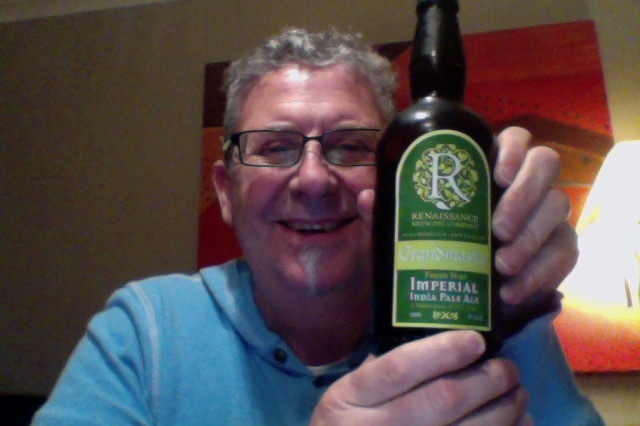 Beer – #763 – Renaissance Enlightenment Series – Boom! This entry was posted on May 13, 2016 by Philip Walter in Beer, Beer of New Zealand, Beer Review, Craft Beer, Critic, Imperial/Double IPA, Renaissance and tagged Alcohol by volume, Beer, craft beer, Grandmaster Fresh Hop IIPA, India Pale Ale, Motueka, Renaissance Brewing, Tennessee.